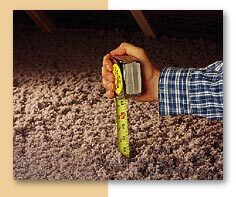 Installing attic insulation is the most cost-effective way to save energy in your home. PG&E and the California Energy Commission recommend R-30 insulation for the San Francisco Bay Areas climate zone. Adding R-30 may save you between 20% and 40% on your monthly heating bill. Insulating your attic with R-30 could pay for itself in reduced heating costs in as little as 18 months. Our installation technicians will usually enter your attic through a hatch found in a closet or hallway. If there is no hatch, we can cut and frame one for you. Once in the attic, the technicians will baffle all recessed fixtures, vents, flue pipes, heat producing fixtures, and openings for pocket doors. This ensures a thorough, effective, and safe installation that meets all building codes and standards. If you have knob and tube wiring in your attic, you will be required to have it inspected for safety by a licensed electrician. Our estimator will tell you if you need an electrical inspection, and can arrange it for you. Our technicians will then install the insulation material you have chosen, such as cellulose or fiberglass, generally by blowing it in. New insulation can be blown right on top of old insulation. The new insulation provides an added blanket of protection for you home. Installing attic insulation usually causes only minor disruptions in the home. If the crew blows in new insulation, they will extend a long hose from the truck to your attic. We recommend that you remove any delicate items from the path of this hose. If they lay down batts in your attic, they will need enough room to bring in bulky bundles of batting material. There is usually some dust produced around the attic opening. Although we put down drop cloths, we recommend that you remove or cover any clothing or delicate items nearby. When finished, the crew will clean up and vacuum. However some dust should be expected. Installing wall insulation is an effective way to save energy. Adding wall insulation is worthwhile even in milder climates. The increase in comfort will be noticeable immediately. Wall insulation also reduces the amount of noise that penetrates inside. Wall insulation in existing homes is installed by drilling holes in the walls every 16 inches between the studs, above and below the fire break. Drilling can be either from the inside or from the outside. We find the exact places to drill by probes and measurements. Insulation material, usually cellulose, is then blown into the wall cavities. After each cavity is completely filled, the hole is plugged and patched. You will need to sand and lightly spackle before painting. It takes about a full day to insulate the walls of an average house. It will be noisy and dusty while work is going on, so you may want so send family members away. If you are having your walls insulated from the inside, you should prepare your house as you would for painting. Move all furniture away from the exterior walls, and remove anything hanging from the walls. The interior drilling and blowing process will produce a significant amount of dust, so you should cover everything in rooms being insulated. We also recommend that you close doors leading to rooms that will not be insulated. Our installation technicians will clean up and vacuum as much dust as possible before we leave. If you are having your walls insulated from the outside, remove anything hanging from the walls. The crews will need access to all exterior walls, so if there are gates especially or fences around the house make sure there is access. Clear any stored items near or against the walls. If you have special shrubs or plantings, you should cover them and rope them back away from the work area. The crew will also need to have continuous access to the inside of the house to monitor the blowing process. We need to check cabinets and under sinks for possible by-passes and to make sure we keep clear of all flues, vents, ducts, and masonry chimneys. Our crews cannot work if they cannot get inside the house. Heat loss through floors is less than through ceilings, but it is still significant. It has been estimated that as much as 20 % of all heat loss is through the floors. Comfort levels will be raised immediately by having your floor insulated. Because the air temperature at the floor is increased, there will be fewer drafts caused by air movement (convection). Floor insulation is also effective in reducing noise that infiltrates from below. R-19 is the recommended level for floor insulation in our area. Our technicians will install batts between the floor and secure them in place by special metal rods. Special care is taken to see that all floor areas are insulated. Materials are made to fit around obstructions, to get you a thorough job. No vapor barrier is required in Bay Area climate zones, but if fiberglass is installed with a backing, it always faces up toward the heated space. Floor insulation is usually installed from the basement or crawl space, so there is no disruption of the living area. The crew will need to know where the access is located. If there is anything stored in the basement or crawl space area, we recommend that you move it out of the way. If the access is inside your home, remove stored articles from the front of the access door. There will be some fiberglass particles generated, so we recommend covering & moving any delicate or valuable items. The crew will clean up and vacuum when finished. If there is dampness under your house, there may be some mud brought in by our technicians. We will lay down drop cloths to protect your floors and carpets.